Mr. Pawoot Pongvitayapanu (Pom) is an online entrepreneur, E-Commerce and online media business leader. He graduated with two master degrees in the Internet & E-Commerce at ABAC University and the Executive MBA from SASIN Business School with Kellogg School of Management USA. He has accumulated his professional experience since 1998 and delivers consulting and lecturing services to public, private, government organizations and institutions. Prior to his current position as Managing Director and Founder at TARAD.com Co., Ltd, Pawoot started his successful business website in Thailand includes ThaiSecondhand.com and TARAD.com (the biggest E-Commerce service in Thailand). In 2009, Pawoot leaded TARAD.com to join with Rakuten Group (No.1 E-Commerce Site in Japan) and become part of a global E-Commerce network of Rakuten Group. He has recently startup a company name “Zocial Inc”, an online & social network monitoring and ranking, together with “WINTER”, a newly born online agency in Thailand. 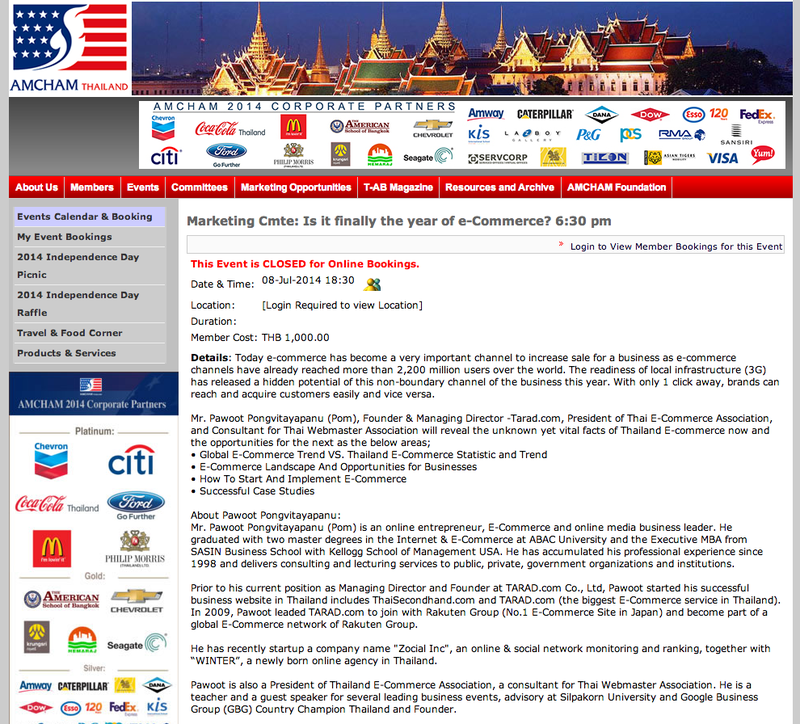 Pawoot is also a President of Thailand E-Commerce Association, a consultant for Thai Webmaster Association. He is a teacher and a guest speaker for several leading business events, advisory at Silpakorn University and Google Business Group (GBG) Country Champion Thailand and Founder.